Thursday night: Evening showers. Few breaks late. 30s. Friday: Developing sun. Windy & cool with a passing sprinkle. Low 50s. 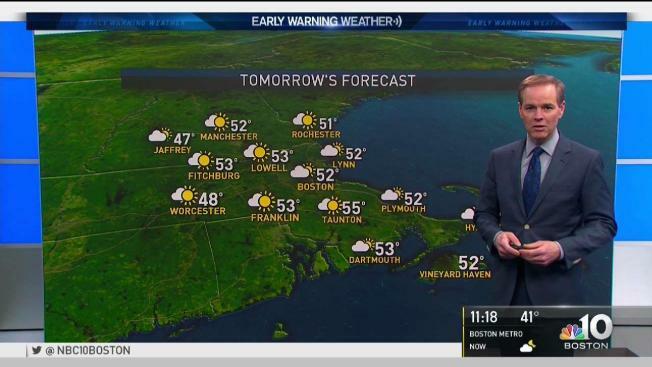 Saturday: Mostly sunny. Low 50s. Winter refuses to quit, with another round of rain and snow moving through New England on Thursday. A dusting to 2 inches will accumulate this morning in the hilly communities of central and western Massachusetts, as well as in parts of western Connecticut, southern Vermont, and southern New Hampshire. While many other towns will still see wet flakes or sleet mix in, the vast majority of the precipitation today will fall as off and on rain showers. It’ll be a chilly rain at that, with highs only in the 40s. Skies stay mostly cloudy tonight with a spot rain shower still in the cards. Over the mountains of northern New England, snow showers will fire up. Lows fall into the 30s, so keep an eye out for an isolated icy spot by morning. There’s still enough energy in the atmosphere on Friday to keep us locked in a mostly cloudy pattern, along with a few renegade showers from time to time. The vast majority of the day will be dry in any given spot though. Highs reach around 50. High pressure slides in this weekend and continues into early next week. That brings a nice stretch of sunshine with highs in the 50s and 60s! Wet weather returns by the middle of next week. Download our free app for the latest weather information and more.